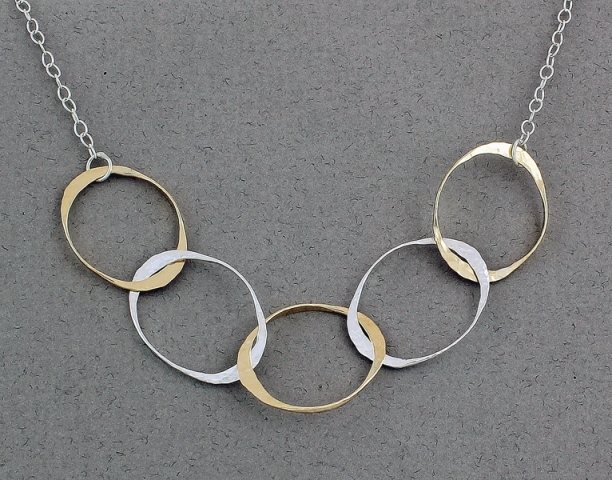 From Peter James - A modern, light-weight necklace that will not require jumping through hoops to pair. This piece is begging to be worn around, on both casual and formal occasions. 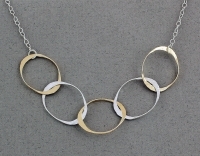 The elegant, round links are presented in alternating Gold Filled and Sterling Silver. It measures approximately 18" long and 3/4" wide. All Peter James jewelry is handcrafted by the skilled artisans at Sausalito Precious Metals. Any item not in stock will typically ship in 4 to 6 weeks. Note: Most items are in stock and will normally ship within 24 hours. If time is essential, please contact us and we will be happy to let you know what is available for immediate shipment. Sterling silver is an alloy of 92½ % Silver (.925) and 7½ % (.075) of a base metal - usually copper. Pure silver is almost perfectly white, very ductile and malleable. It is considered too soft for jewelry or flatware use, therefore the addition of small amounts of a base metal serve to harden the alloy. Gold filled provides the color and luster of solid karat gold while keeping costs down. People often confuse Gold Filled with Gold Plate. Gold plate is a very thin coat of gold electro-plated over a base (non-precious) metal. Whereas, Gold Filled is made by mechanically bonding a much heavier layer of karated gold over the base metal. Peter James jewelry is made in California. All of the designs are original, fabricated from sterling silver and gold filled. Every piece is cut, shaped and textured to form the variety of innovative designs that Peter James Designs is recognized for.